and Benedict Boulevard. The building is now a nail salon. On July 16, 1928, when the New York Times published the obituary of William E. Harmon, the newspaper quoted from an interview he had given years earlier in which he described how he started his real estate empire. “The surest way is to hit upon something that everybody wants, make it possible for everyone to buy it and then let everyone know that I have it for sale. But what does everyone want? ‘Land’ was my answer. That is what everybody would like to own. It wasn’t easy to buy land in those days. The first payments were always so high that a man with little money could not meet them. So most folks went wanting land, but they didn’t buy any. I worked out a plan by which even the smallest wage-earner could buy a building lot. All the purchaser needed was one dollar to pay in cash and a few cents to pay each week. It was simply the installment plan applied to real estate, and I was sure it would work. 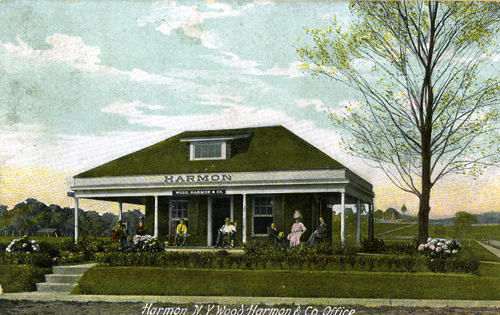 I went to Cincinnati, where I had a brother, Clifford B. Harmon, and an uncle, Charles E Wood. I told of my new idea, and they liked it.